This brass jewelry holder is inspired by the golden lotus—a symbol of enlightenment. Choosing the perfect jewelry each day might not lead to enlightenment, but a golden lotus to hold your collection couldn't hurt. This lotus-shaped brass grid keeps a large selection of earrings neatly organized, while four hooks at the bottom hold necklaces in an elegant hanging display. Lotus flowers are central to Buddhist tradition, symbolizing stages of enlightenment and purification stemming from the chaotic, murky waters of everyday life. 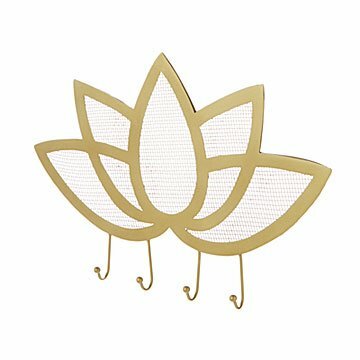 Golden lotus flowers like this one are symbols of ultimate enlightenment—and the closest thing to accessorizing your way to Nirvana. Handmade by artisans in India.